Raleigh is the home of famous North Carolina State University, qualifying it as one the three “research triangle” cities. The two other cities, Durham and Chapel Hill, host Duke University and University of North Carolina – Chapel Hill, respectively. This makes Raleigh a flourishing cultural and professional hub for college students and young professionals alike. It’s elegant mixture of historic and modern, featuring gorgeous landmarks aside more urban fare, like festivals, bars, and restaurants. It has been #1 best place to live by Businessweek, and has been praised by numerous other publications. Its old Southern Charm, combined with an undeniable sense of steady progression, is sure to win your heart. With over 90,000 students living in and around Raleigh, your apartment search will be heavily influenced by the various school calendars. Students will often begin searching as early as November. The peak months are May and June, so plan to start your search in the spring before availability becomes a problem. 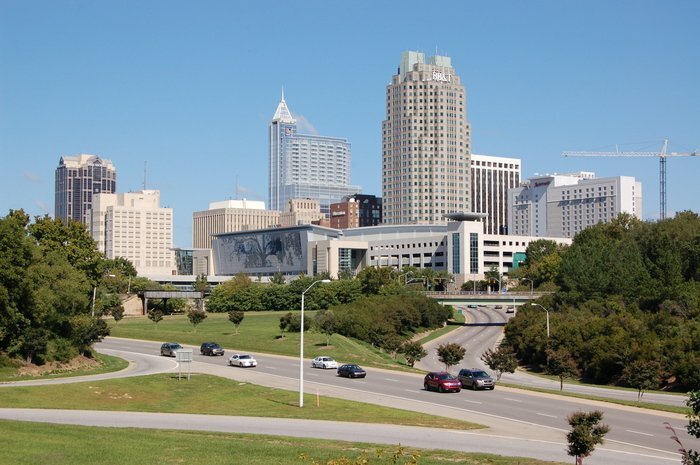 Raleigh is located where the North American Piedmont and Atlantic Coastal Plain regions meet. The area is known as the "fall line" because it marks the inland point where waterfalls begin to appear in creeks and rivers. As a result, most of Raleigh features gently rolling hills that slope eastward toward the state's flat coastal plain. Getting around Raleigh is a delight. There's little traffic to speak of and with its mild weather, walking and biking around town is pretty easy. Local bus service is provided by Capital Area Transit and the Raleigh Trolley. In addition to some great college sports, Raleigh has been rated as one of the "hottest sports cities" in the country with the NHL's Carolina Hurricanes and the Arena Football League's Carolina Cobras. But sports aren't just a spectator sport in Raleigh. The city has more than 7,300 acres of park land and more than 1,300 acres of water and 21 public golf courses, 112 lighted tennis courts, and 8 public swimming pools. Raleigh is considered an exceptional place to live because of its laid back atmosphere and big city amenities, and the local attractions reflect this. Get better acquainted with the city by visiting the Raleigh City Museum or stately North Carolina State Capitol, giving you a peek into the city’s intriguing past. More interested in an outdoor excursion? Visit the JC Raulston Arboretum, which boasts 10 acres of unique landscapes and flora. If you want to get in touch with your childish side, consider stopping by the Marbles Kids Museum, which offers fun interactive exhibits and a zany atmosphere. This is the perfect place to take the family when they come to visit, especially if you with younger siblings! The research triangle is known for its culinary delights and Raleigh is no exception. You can find diverse eats just about anywhere here, whether you're looking to munch on Laotian fare or stuff your face with Creole cuisine. The center of Raleigh’s more lauded food scene is downtown, which is home to many artisan restaurants and even a James Beard award-winning chef at Poole's Diner. If you're into smaller, more off-the-beaten path joints, you'll find plenty of those in the City of Oaks as well – particularly around the University. Food trucks are abound, serving everything from Chinese Dumplings to BBQ. If you love a good drink, Raleigh is here to oblige. Downtown and Glenwood South are known for their upscale bars and off-the-charts craft cocktails. The presence of North Carolina State University in Southwest Raleigh brings a number of cheaper dive bars to Hillsborough Street, the heart of the city’s college drinking scene. Mitch’s Tavern in particular is considered a staple for students. If you're looking for a wide variety of options that could fall anywhere on the spectrum, then City Market should be your destination. Craft beer lovers can also enjoy several microbrewery tours and some delicious drinks throughout the city! The research triangle is known for its vibrant culture, making it a true U.S. destination for art and performance lovers. In fact, Raleigh itself has been dubbed the "Smithsonian of the South." If you love touring through museum to look at artifacts and art, check out the North Carolina Museum of Art, Contemporary Art Museum, or the African American Cultural Complex. If theater and music is more your thing, stop by the Progress Energy Center for the Performing Arts to see a local play, opera, ballet, or symphony performance! The residents of Raleigh are always up to something and the city makes it easy with its many annual events. If you love being exposed to new things, then check out the International Festival – a three-day celebration of diversity that showcases food, art, music, and dance from around the world. Music lovers can the 3-day Hopscotch Music Festival in downtown, enjoying different bands from a wide variety of genres. The most well-known Raleigh event by far is Artsplosure, one of the most vibrant arts fests in the Southeast. Every third weekend in may, the city gathering around historic Moore Square and enjoys the work of many visual artists, along with craft stations and live jazz music. Even if fests aren't your thing, Artsplosure is a must-see! Raleigh offers a wide range of shopping delights to choose from, ranging from huge national chains to small local boutiques. The city boasts many different shopping malls, each offering their own special experience. Triangle Town Center & Commons offers many upscale names, such as Saks Fifth Avenue and luxury brands like Nine West. One of the most beloved shopping destinations in the area is Crabtree Valley Mall Cary Towne Center, which boasts a large number of stores and delicious eateries. For a more intimate shopping experience, take a browse through the beloved Raleigh Flea Market or State Farmers Market. Unlike many cities, sports typically don't come first in Raleigh. Of course, that doesn't mean that people don't enjoy a game or two every now and again. In the football and basketball department, people love the North Carolina State Wolfpack. When the University plays any of their local rivals, the games draw big crowds. During the winter months you can head over to the PNC Arena for an enthusiastic NHL Ice Hockey game. The people of Raleigh are surprisingly serious about the Carolina Hurricanes and even tailgate for each game. More interested in a little sports history? Stop by the North Carolina Sports Hall of Game, an exhibit featuring items once owned by over 360 of NC’s champion athletes. Raleigh is pretty serious about its green space. From dog parks to recreational paradises, the City of Oaks is sure to charm you with its lovely outdoor spaces. Apex Community Park is the largest in the city, boasting over 160 acres of paved trails, beautiful woods, and a gigantic lake. Have a lovable pooch in your life? Let them off their leash in the Millbrook Exchange Park, which offers three separate areas for dogs to run about leash free. If you're hoping for a more scenic experience, head over to the Raleigh Rose Garden in Cameron Village and enjoy the charming blooms and outdoor amphitheater. These are only some of the many beautiful places where a nature lover can find sanctuary in Raleigh.